The persistent targeting of Muslims in France requires a left response. But the spread of anti-Muslim sentiment in French society has become impossible to deny. Today, Marine Le Pen of the far-right National Front (FN) is at the top of polling for next year’s presidential election. Le Pen is well-known for her vitriolic denunciations of immigrants and Muslims, whom she accuses of “colonizing” France. Just last year she went on trial for incitement to racial hatred (which is a crime under the French legal code) after comparing Muslims praying in the streets of French cities to the Nazi occupation. Over the past few months, hostility to France’s estimated five to six million Muslims (the exact number is unknown due to laws preventing officials from asking about religious affiliation) has reached a crescendo, fueled by the January and November 2015 terrorist attacks, and by this summer’s Bastille Day rampage in Nice. After the most recent attack, the government extended a state of emergency, which has now lasted for almost a year. The measure gives the state license to launch a major escalation of police repression, which has been felt heavily in the predominantly immigrant working-class suburbs that surround big cities like Paris. But even before last year, French political leaders had an extensive record of whipping up Islamophobic sentiment through measures ostensibly designed to defend traditional notions of “laïcité,” but actually directed at the country’s growing Muslim population. In 2004, for instance, the government passed a controversial bill banning schoolchildren from wearing the headscarf in public schools. More recently, the state passed another law prohibiting women from appearing in public in the burqa. And just during the past year, a new controversy has flared up over the dismissal by school officials of Muslim students whose skirts were deemed to be excessively long (and thus a violation of laïcité). This is the background to the latest battle over the “burkini,” initiated when several municipalities in the south of France moved to ban the garment from public beaches. In the past, the attitude of the French left toward these kinds of issues was decidedly mixed. In 2004, for instance. the Left was split almost down the middle over the headscarf ban; in fact, the controversy that preceded passage of that law began when two leading figures on the far left led the charge to remove a pair of young girls from their classrooms for wearing the headscarves. These attitudes appear to have shifted somewhat in recent years in positive directions. However, the influx of refugees from Syria has put renewed pressure on the Left to confront questions of racism in French society. In the last couple months, Jean-Luc Mélenchon, the main candidate of the far left for next year’s presidential election, has denounced the European Union’s policy on refugees for threatening to generate a mass influx of migrants over the next few years. Mélenchon, who is clearly trying to undercut Marine Le Pen by stealing her thunder, has been careful to say that he does not want France to close its borders. But his rhetoric has raised many eyebrows in left-wing circles, and added to the feeling of hysteria around Muslim migration to France. The following piece, translated from French by Saad Ghosn and David Sewell, offers an account of the burkini controversy and the broader context of Islamophobia in France. The burkini ban ushered in a new stage of the Islamophobic offensive that has plagued France for so many years. And once again, the ruling class led the attack. The temptation, among the Left, is to understand this phenomenon as a diversion tactic, distracting from “real problems” like unemployment and economic inequality. Instead, socialists should see Islamophobia as an oppressive system, rooted in a variety of discriminatory strategies that target the French Muslim population. Alongside the generalized racism that pervades French society, Muslims are also marginalized by virtue of their religion: a survey recently showed that French citizens of Senegalese descent are two to three times less likely to get a job interview if they are Muslim rather than Christian. The result would surely be the same if we examined housing, contact with police, or education. Islamophobia’s first effect is to make Muslim lives harder. But by unifying a white racial bloc against Muslim workers, it also prevents any kind of self-organization among the most oppressed sections of French society. To combat this, France needs a genuine antiracist movement, and socialists need to help build it. Leading politicians usually excuse their Islamophobic policies by pointing to their constituents’ preexisting “expectation” or even “exasperation.” But until this August no one seemed concerned that a few women — and men — swam in outfits that covered most of their bodies. Over the past thirty years, moral panics have erupted around everything related to Islam: the scarf at school, the burqa on the street, halal meat, and long skirts (again at school). The burkini is simply the most recent example. In each case, political representatives — mostly from the Right — led the charge. They repeat the same national debate, and it always leads to questions about Islam’s compatibility with the Republic. The ruling class has the same goals each time it initiates one of these attacks: represent Muslims as a threat, and, more deeply, portray them as foreign to French society. The burkini ban follows all the steps laid out by prior erosions of French Muslims’ rights. 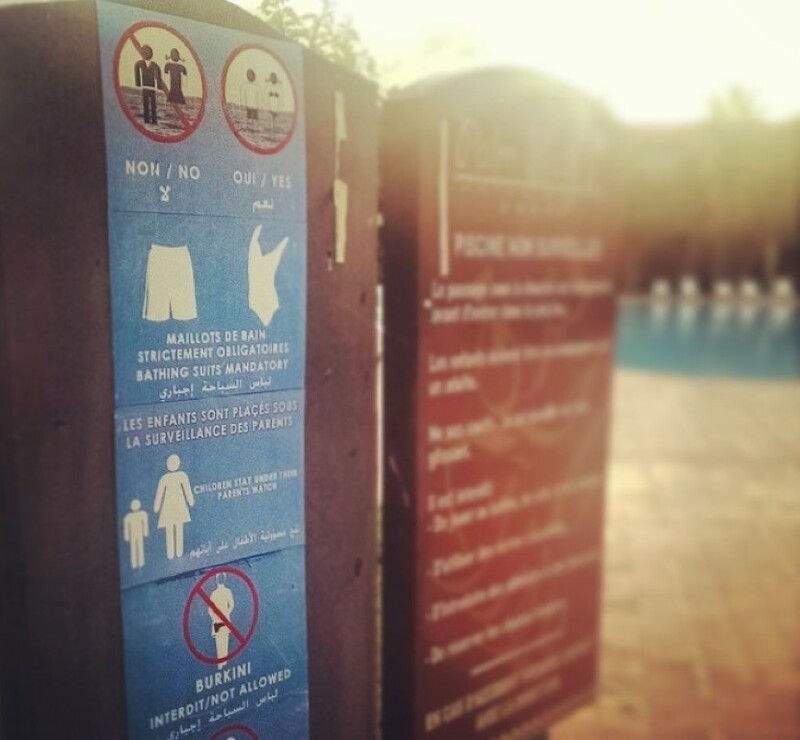 In early August, several senators — in particular the National Front senator-mayor of Marseille, Stéphane Ravier — denounced the planned “Burkini Day” at Speed Water Park in Les Pennes-Mirabeau. For one day, the pool would admit only women and children; women were expected to wear burkinis or other modest bathing suits. Ravier’s first polemic frightened the director of the park enough to cancel the event, but it didn’t garner much national attention. That took Mayor David Lisnard, the Republican mayor of Cannes, issuing his infamous anti-burkini decree, which forbade “any person not wearing decent dress, respectful of good morals and of secularism [laïcité]” from the city’s beaches. In the context of a state of emergency and in view of the recent Islamist attacks, in particular those of Nice a month ago . . . to wear a distinctive dress, other than that of a normal bathing outfit, can indeed be interpreted in this context as not only representing a simple sign of religiosity. The burkini, according to the court, does more than mark a particular kind of religious observance; it raises improbable security concerns. But for whom? By allegiance, of course, Migoule means to evoke ISIS’s murderous ideology, presenting these women as its representatives (if not its proselytizers). These Islamophobic amalgams — between Muslims and terrorists — have become explicit, while basic facts — including, for example, that an estimated one-third of the Nice victims were Muslim — go unsaid. If things continue this way, it will soon be acceptable to ban the djellaba, the hijab, even the beard. Of course only Muslims — or someone “looking like a Muslim,” to paraphrase ex-president Nicolas Sarkozy — will be subject to these laws. The political class — desperate after last spring’s political unrest — and the media — always in need of fresh, hot takes — rejoiced at the burkini ban, which was only contested by a few radical left parties like the NPA and Ensemble. Starting from this place, it didn’t take much for Jean-Pierre Arbey, a right-wing delegate from Meurthe-et-Moselle, to feel empowered to tweet “Nacht und Nebel to the trash bag.” This reference to the Nazi deportation program accompanied a picture of a woman wearing a burqa on the beach. To support her crony’s unbearable racism and misogyny, she claimed that Muslim women who wear the headscarf are the ones “comparable to the Nazis, who have exterminated people.” Godwin’s law seems to have taken over French politics, even at the highest level of government. I understand the mayors who, in this time of tension, have the reflex to seek solutions, to avoid disturbances to the public order . . . I support, therefore, those who instituted decrees, provided they are motivated by the desire to encourage living together, without ulterior political motives. Beaches, like any other public space, must be spared religious claims. The burkini is not a new line of swimsuits, or a fashion. It is the expression of a political project of antisociety, one also based on the enslavement of women. Islamophobia extends even to government entities that are supposed to represent French Muslims. Jean-Pierre Chevènement — a longtime figure of the center left and former minister of education and interior — is supposed to become the director of the Foundation for Islam in France, which is to be founded in October. He advised Muslims to practice “discretion” in public. His recommendation says a lot about both his office and the government that gave it to him. Obviously, Chevènement’s suggestion sounds more like a threat; you can almost hear the “otherwise” that would normally follow such a statement. The media amplified his subtext by broadcasting a survey that claimed 45 percent of Catholic churchgoers now consider Islam a threat. Muslims apparently not only lack discretion, but the “natural reason” that would allow them to function in public space and to contribute to public interest. The Islamophobia that ministers, elected officials, political leaders, and know-it-all editorialists spread and strengthen has a concrete impact on the lives of millions of French people. It legitimizes systematic discrimination, assaults on women in hijabs, racist speech, and even the imperial wars that the French state wages, claiming to free people from barbarism. What happened this summer in the village of Sisco, on Corsica, demonstrates the violent results of this consensus. A brawl at the beach escalated into a riot, with hundreds of people heading to Lupino, a working-class and multiethnic neighborhood, chanting, “This is our home!” They assaulted a young person, who was being treated in a nearby hospital. We were at the beach for a picnic. Everything was going well, when a group of young people started calling us “dirty Arabs,” shouting “Allahu akbar” and taking photographs . . . I went to talk to them but they didn’t want to hear anything. We decided to leave so not to make waves. When we reached the parking lot, there were four cars with men armed with baseball bats. They jumped us and started beating us . . . We were stuck there for five hours, at the same place, people throwing rocks at us. They burned our cars in front of the police who did nothing to stop them. It is still difficult to say exactly how the fight began, but in any case it seems clear that the Sisco population escalated, perhaps even initiated, the conflict. This illustrates the consequences of political Islamophobia. The Lupino riot, like other racist events, was far from spontaneous: it derived almost directly from the climate political leaders, elected officials, and mainstream media outlets have created. Why have politicians constantly deployed Islamophobia in the last fifteen years? Almost always, these political and legislative attacks have been aimed at improving the image of a government or party in decline. Right now, the two capitalist parties — the Socialist Party (PS) and the Republicans — are weakening. Watching the rise of the National Front, they feel compelled to compete on the far right’s field in hopes it will pay back electorally. Separate from the electoral cycle, the issue takes on new importance. These politicians promote national cohesion on the backs of the millions of Muslims living in France as well as all those potentially considered alien — migrants, Roma, and black people. This renewed racial covenant unites the white population around a common enemy, crushing any dissent, any form of social conflict. Movements like this spring’s Nuit Debout but also the series of strikes in strategic sectors (refineries, nuclear stations, railway, sanitation, etc. ), which illustrated Stathis Kouvelakis’s theory of an “extended crisis of hegemony,” index the French ruling class’s inability to build a majority social block around its neoliberal project. Its failure to shore up support has elicited this authoritarian and racist response. But that doesn’t mean the racist offensive has ended. It will continue, backed by a political front that stretches across the political spectrum. What does Valls mean by this? Certainly not that he cares about women’s rights; no attempts were made by Valls’s government in the last years to reduce sexist discrimination and violence. Simply, he wants to reiterate that the battle is far from over — and that it won’t be played out on a judicial terrain. As in the 1990s and 2000s, the political and ideological offensive has just begun. The court decision is a victory, but a partial one. It doesn’t overturn fifteen years of Islamophobic laws and brings only a provisional respite from the burkini ban. But we know what happened ten years later. After an enormous campaign, center-right president Jacques Chirac and Prime Minister Jean-Pierre Raffarin managed to impose the draconian law that banned headscarves — and every religious “conspicuous” sign, but Muslims were clearly the target of the political campaign and the law — in all state schools. Thanks to legislation that claimed to liberate them, dozens of female students were excluded from state schools, and thousands more were forced to submit to the new legislation. Chirac and Raffarin’s victory took years of ideological work. They had to redefine secularism and make headscarves — and by extension, the people who wear them — look like a problem. Their long con was hardly subtle. The government drew attention to education at the very moment it was drastically cutting funding. And yet it worked because it built on the long-standing divide between European-born French citizens and descendants of the people once subject to French colonialism. Further, the ideological terrain had already been prepared. Muslims had long been portrayed as a threat to state education — and to the universal values that state education ostensibly embodies. Valls inherits this dynamic of Islamophobia. Like every professional French politician, he constantly refers to the Republic’s values. In the name of republican coexistence, he summons Muslims to help the state while it creates new obstacles to their free religious expression. No doubt, he has now become one of the main agents of a civil war. It’s a low-intensity, undeclared war, but a war nonetheless — one that combines class warfare and colonial oppression, seeking to break the resistance of the oppressed and to block the solidarities that can be built between them. It takes both ideological and military forms. The state of emergency announced after the November 2015 attacks — and repeatedly extended since — has allowed for even more repression in poor suburbs: more racial profiling, more house arrests, more raids. In sum, more racist and arbitrary policing. On July 19, the death of twenty-four-year-old Adama Traoré while in police custody reminded France’s nonwhite and non-Christian residents of what has for decades been a daily reality — police officers can murder black people and Muslims and walk away unpunished. This war targets Muslims and the poor, but also the Roma. In 2013, Valls was charged with incitement to racial discrimination over a speech that tried to justify the “respectful but particularly firm” destruction of Roma camps. He claimed that “these populations have ways of life that are extremely different from our own” and are “clearly in conflict” with local populations. These words have consequences. They produce the conditions for racist policing, while constructing the mirage of an enemy within. They lay the ground for violent, racist outbursts by giving confidence to the most hateful elements of the population, whether they are organized in far-right parties or not. In Calais, migrants are regularly kidnapped and beaten, sometimes even left for dead. In Marseille, a Roma camp was recently attacked with Molotov cocktails. “To exist is to exist politically,” wrote the Algerian sociologist Abdelmalek Sayad. Racism, particularly in the form of Islamophobia, tries to prevent the descendants of the colonies from doing this autonomously. But it also aims to solve the crisis of hegemony by building a “national community,” knitted together against Muslims. One of the central challenges of the years ahead is to build and unify a vast movement that can contest this project. It mustn’t come at the expense of mobilizing around specific demands, for instance the repeal of all Islamophobic laws. Antiracist activists should also be invited to speak out when the Goodyear workers go on trial this October. Likewise, the trade union movement must show solidarity with the families of victims of police murder. But there are no shortcuts. To push against the immense forces that face us, we must prepare for a sustained struggle that will continue after the 2017 presidential election. Judicial battles must be fought, and we should hail the CCIF and LDH for their work in this area. But an antiracist political response — too long neglected by the radical left and the trade union movement — must come, too. Recent antiracist and anti-imperialist demonstrations have shown that colonized people’s descendants already possess an independent political capacity ready and willing to confront the state. The March of Dignity last October and the demonstrations that erupted after Adama Traoré’s murder follow the events of the summer of 2014, when people marched in solidarity with Palestine and joined movements for the undocumented. Similarly, the audience gained by the CCIF reflects a widely shared willingness to give serious consideration to Islamophobia and to combat its hold on French society and politics. The radical left and the labor movement still treat these mobilizations paternally at best and contemptuously at worst. But antiracism represents a crucial component of any emancipatory politics. It is not enough to support these movements from the outside; socialists must develop a politics that confronts race, forges alliances with already existing organizations, collaborates with them to formulate shared claims and proposals, and intervenes on the ground. This summer’s Islamophobic episode shows once more that racism cannot be solved by economic victories — for wages, employment, and so on — which won’t suffice to unify the whole working class. The ruling class is trying to build a new national identity built on a racist covenant. Without the emergence of an antiracist political movement — radical and autonomous, led by those primarily affected — they will surely succeed. In the months and years to come, French socialists should contribute to fighting this.